What fast food chain founded in 1964 was named for brothers Forrest and Leroy Raffel? Trivia: What fast food chain founded in 1964 was named for brothers Forrest and Leroy Raffel? Over the past 50 years, Arby’s has grown a considerable amount and is now the second largest fast food chain nationally with over 3400 locations. Every state has an Arby’s except for Rhode Island and Vermont, and there are limitations internationally, as well. Speaking of international, Arby’s first international location was opened in 1981 in Japan (and sadly closed later). However, the international reach didn’t just stop at Japan. Qatar, Turkey, and Canada also have the chain. One of the reasons why Arby’s has grown so quickly over the past 50 years is due to the company being the pioneer in the fast food world in regards to health. In 1994, Arby’s was the first fast food restaurant to ban smoking in all company locations and franchises nationally, well before all other fast food chains followed suit. In 1996, Arby’s introduced a complete “light” menu, with all choices under 300 calories. No fast food restaurant had ever done that before. Prior to this change, the only “light” choices offered at fast food locations were salads. And finally in 2006, Arby’s became the first major fast food chain to eliminate all trans-fats from their menu. After doing so, Arby’s also came out publicly to criticize other competitors for not eliminating trans-fats, as well. Arby’s has grown nationally and internationally and is currently headquartered in Sandy Springs, Georgia. 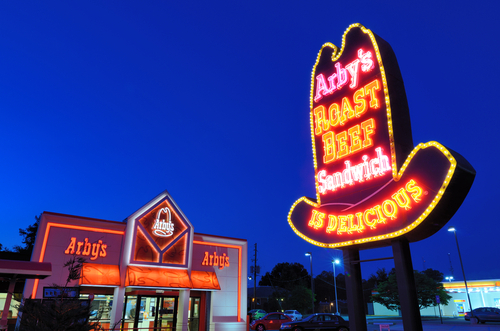 Two companies now privately own the Arby’s company: Roark Capital Group (holding 81.5 percent) and The Wendy’s Company (holding 18.5 percent). Arby’s, while they have continued to expand over the course of half a century, have stayed true to their original values and still carry some of their classic menu mainstays since the very first location opened.